Okay folks. I’m leaving for Otakon 2010 in about 36 hours, and thankfully my costume is finished. It took several days to do everything else, but I was working so hard I didn’t have time to write about it. So here goes! Okay, I’m condensing a few days into one post because it is ALL about the stupid bodice. And it’s not even finished yet! AAAAH! On Day 3 I did exactly one thing: put a lapped zipper in the back pieces of the corset. A lapped zipper is like the zipper on your jeans, it’s hidden by a flap. I found this video tutorial that is pretty clear and uses only normal 5/8″ seam allowances (as opposed to creating an extra piece to cover the zipper or whatever) to create the lap. It took a bit of time and was difficult, but it came out looking pretty great. 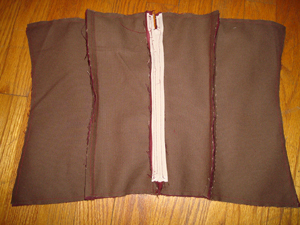 I picked out a beige separating zipper only because they didn’t have the kind I needed in dark red/maroon. 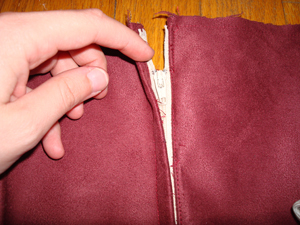 I had a maroon invisible zipper (and even picked up an invisible zipper foot! ), but the pattern called for a separating one, which will make it easier to get the thing on and off anyway. Nice, right? You can barely even see it! Oh wait, there it is! Stupid beige. Oh, well, I’m glad it isn’t so visible normally. I was concerned about folding the fabric + the interfacing over like that (and it was harder to sew than it could have been because of the cotton duck crap), but I think the thickness makes the flap sturdier and covers the zipper better. 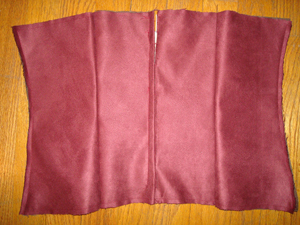 This is the inside (thanks, flash, for making my crappy seams invisible! Haha!). Since I can’t iron suede, I used my handy wallpaper roller to press the seams down a bit. It doesn’t work all that well. Anyway, as you can see, the zipper is not quite long enough (I am still debating whether to use bias tape for the edges or just sew the lining on normally… this would take 5/8″ off top and bottom), so I think there will be more hook-and-eyes in my future. So, Otakon. It’s the biggest convention I go to all year, and this will be my third year attending. I have done two cosplays each year; the first year was Temari’s second outfit (from Naruto, naturally), and Shiki from The World Ends With You (the Nintendo DS game). The second year was Nausicaa, from Nausicaa of the Valley of the Wind, and Red from Dragon Quest VIII. My thing with cosplay is that I have to really like the character, or I won’t be motivated and the costume won’t come out well. Out of my costumes so far, only Red’s was a kind of unhappy with (though this dissatisfaction stemmed mostly from the hair, which was impossible to replicate with the supplies I had. I need to learn hair skillz!). For some reason, after last year I was unmotivated to cosplay in general, but now that I’ve started my costume for Otakon 2010, I am back in the game. A friend recently started playing Final Fantasy X-2, which reminded me of how much I liked the game, especially all the neat outfits Yuna, Rikku, and Paine fought in. So after much deliberation, I decided to cosplay Trainer Yuna. It’s a colorful outfit that will be challenging to make but will be really eye-catching when it’s done. Over the next month I’ll be chronicling the process of making the costume. What follows are the first two days’ work of creating the costume.